All chess clock have a few things in common. They have two clocks positioned side by side, one for the white pieces and one for the black pieces. There are two buttons or a lever. Depressing the button on your clock will stop yours and start your opponents. The first choice to make is whether you prefer an analog or digital clock. Many purists prefer the analog clock. Each clock is set just as an analog wall clock would be by twisting a knob on the back until the hands line up correctly. There is a flag hanging from the 12. When the time has expired the flag will fall and players are responsible for noticing when this happens. Some analog clocks run on batteries while others require winding. Most are shaped in a rectangle with the buttons on top. Each button above its respective clock. Today the casing is usually made from a polymer or plastic but older ones are typically made of wood and are much more durable. In most cases, an analog chess clock will be less expensive than a digital one. Digital clocks are very popular for a number of reasons. The LED displays the time remaining to the second. Many players feel they need to know exactly how much time they and their opponent have remaining. Many of the digital clocks have a much lower profile so players do not have to lift their hands very high to depress the button or lever. Some digital clocks are able to connect to specially designed boards that can sense when a piece has been moved and automatically stop and start the clocks. When one of the players runs out of time, an alarm sounds letting them know the game is over. Tournaments are the most obvious reason people use chess clocks. Each player has the same amount of time to complete either a set number of moves or for the entire game. If one player runs out of time, they lose the game. It is a good way to ensure the players have a fair game. Many casual players prefer using a chess clocks as well. Lightening and blitz games are popular and rely on heavily on chess clocks. In lightening games the players will have between 1 and 3 minutes each to complete the game. Blitz uses time controls between 3 to 10 minutes per side. Chess clocks are also used to handicap games. If one player is much stronger than their opponent, they may only have 5 minutes to complete the game while their opponent has 15 or 20 minutes. Many instructors use chess clocks to help ensure pupils have memorized various opening lines. By putting strict time controls on the opening sequence of moves, they can easily determine how efficiently a student has mastered an opening. The same methods are also employed in end games to evaluate how well the student understands various principles. Chess clocks have been around for years and are as important a part of the game as the pieces themselves. If you haven’t played chess on the clock, you are missing out on one of the most exhilarating aspects of the game. 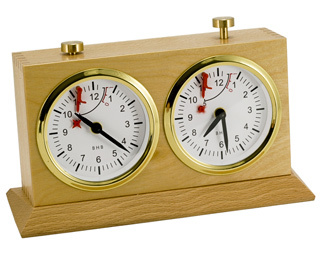 The Regency Chess Company® in the UK is one of the largest stockists of chess clocks with some excellent prices too.